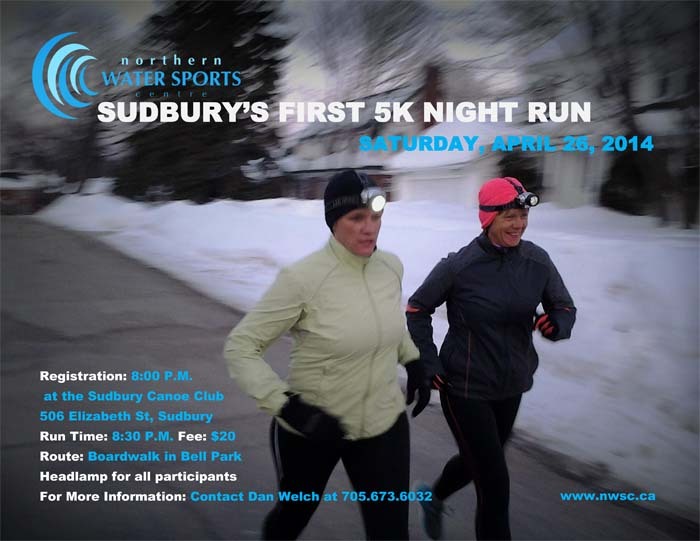 75 Thoughts Every Runner has..
Upcoming Local Events - 1 - Sudbury's First 5km Night Run and - 2 - SudburyRocks!!! Did you know that the week of April 6th through 12th is National Volunteer Week? In honour of National Volunteer Week, we would like to send a heartfelt thank you to our dedicated Sudbury Rocks!!! volunteers, and a welcome to all our new volunteers. • Is good for your mental health. Volunteering helps people manage and lower their stress and improves their mood. • Is good for your physical health. Volunteering keeps you active and has been shown to reduce chronic pain and heart disease symptoms. • Helps you develop new skills. The Sudbury Rocks!!! Race, Run or Walk for Diabetes is Northern Ontario’s largest road race, and a race of this magnitude depends on an enormous volunteer support crew. Our support crew includes over 350 volunteers who help with every facet of our race. From registration to finish line support, volunteers are on board helping make our race a success. 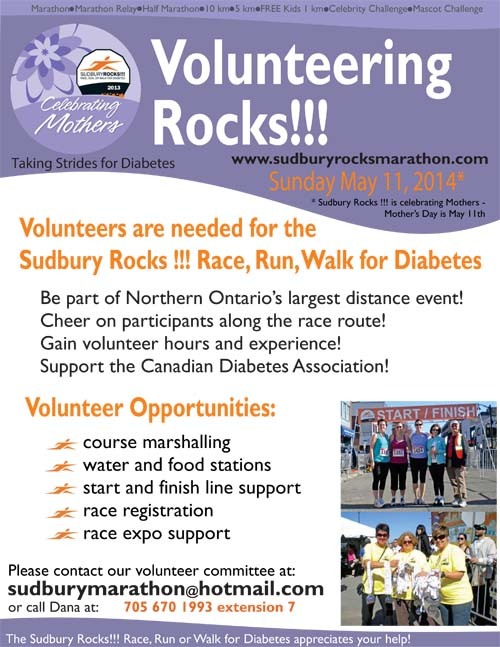 Please celebrate National Volunteer Week and the Sudbury Rocks!!! Race, Run or Walk for Diabetes. Already volunteering? Thank you! Considering volunteering? Please email us (sudburymarathon@hotmail.com), we would love your help! Running? Take a moment to thank the volunteers you encounter on race day. We couldn’t do it without our volunteers! 3. Well, five miles is only two and half miles each way, which is basically two miles each way, so I’m really only running four miles. That’s not too far. 4. It’s starting to feel far. 10. Oh, crap! A fellow jogger! 12. I’m totally gonna wave. 13. OOOK, they didn’t wave back. Never doing that again. 15. Man, I think I’m hitting that “second wind” thing my gym coach was talking about. 16. Wait, never mind. I’ve been running down a decline. 23. Bodies. Body. Bod-ay. Runnin’ all day, no one can catch … may. 27. I’m running five miles so I should probably eat five slices of pizza. 31. Forget the salad actually. 33. Is this a contest to see who’s the worst at walking? Because you are both champions in my heart. 34. Maybe if I pound my feet on the ground they’ll hear me coming and let me pass. 35. Oh, God. They didn’t turn around and now I’m right behind them. They’re going to think they’re getting mugged by the world’s sweatiest criminal. 38. Hi hi hi please don’t hit me with your car. 40. Thank you, Mr. Blue Honda. I’m trying to smile at you but it probably looks like I’m having a stroke. 45. Heck yes. Three miles down, two to go. It’s all downhill from here. 53. Holy crap, prancing is exhausting. I am exhausted. 58. OK, let’s not go down that road. 59. Focus. Focus on that sweet, delicious ‘za waiting at the finish line, calling your name with its cheesy breath. 65. That’s just 15 miles each way, which is practically 10, and 10 is twice five, and I can run five miles EASY. 66. That’s it, I’m doing it. Thirty miles. 67. Thirty-mile marathon…30-mile marathon…30 Rock marathon. 68. On second thought, I’ll probably just binge-watch every episode of 30 Rock. That takes a lot of dedication and I will be winded from laughing so hard. March 4th to April 1st 2014, averaging a marathon a day. It’s done. 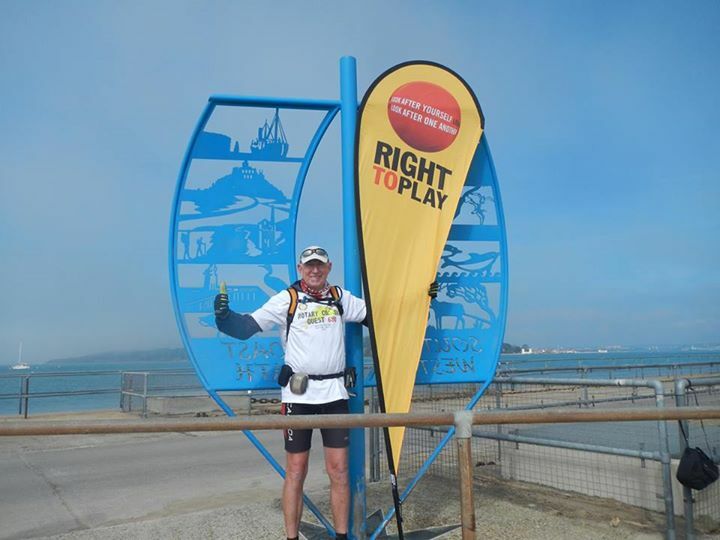 I started Rotary Coastal Quest 630 on March 4th at Minehead, Somerset and finished the South West Coast Path on April 1st at South Haven Point, Dorset. I must admit though two weeks ago I didn’t think it would happen. 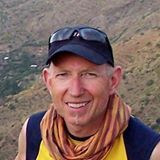 I had completed 300 miles around the North Coast of Devon and Cornwall and Kurt Kowalchuk, President of the Rotary Club of Calgary Sarcee, had joined me on the run. That morning we were crossing the beach at Porthallow to look at the half way marker when I bashed my left shin on a boulder. I didn’t think too much of it but the next day it started to ache. The day after the muscle was inflamed and the repetitive strain injury I had had in 2010 was back. I tried to run but it was no good and that night it was time to get acquainted with an old friend, frozen peas. Every night we were picked up by Rotarian hosts and taken back to their place. Rotarian David Laud had organized this and he made sure they knew about my medical needs. During the trip I talked at a number of Rotary clubs including Minehead, Bude, Brauton Caen, Bideford, Launcetown, Wadebridge, Perranzabuloe, St.Ives Bay, Plympton, Plymouth, Torbay and Ringwood. They call this route the South West Coast Path however I must question the name. To me a “Path” is two people wide, gravel and rolls up and down hills. What I came across was more like a goat track. The route would head up a cliff, sometimes with steps, then straight down the other side through brambles and large mud puddles. Daily mileage ranged from 20 to 32 miles and instead of the planned 7 hours a day I was on the trail for 9 to 11 hours. My shin slowly improved but because I compensated for the injury my left knee and hamstring started to seize up. This situation wasn’t helped with the large number of diversions I came across. The cliffs had been hammered by the winter storms and particularly along the Dorset coast rerouting was the norm. The last day I walked up Shell Beach and Sue and her sister Lynne came to meet me. We arrived at South Haven Point at 11.30am and were greeted by our friends Stephen, Marlene, Pip and Bev, Logistics Manager David and George. It was over, 4 weeks and 630 miles completed. It wouldn’t have been possible without the help of Rotarians across the South West. Why did we all push ourselves to the limit? To support Right To Play and help kids. Now that’s the best reason in the World. April 1, the end of the South West Coast Path at South Haven Point, Dorset. It appears that spring has finally arrived for us in the north and just in time too, as we are just over a month away from the biggest road race of the year in Sudbury. The Sudbury Rocks! race, run or walk for Diabetes goes Sunday May 11th. The race routes have had some minor changes made to them this year so be sure to check out sudburyrocksmarathon.com for all the updated information on this year's event! Join us on Wednesday nights at 6pm and Sunday mornings at 8:30 for our 5k, 10k and half marathon clinics that are training for the Sudbury Rocks! race.